Our Lakeland Planter Has The Look Of Wood Without The Upkeep. Molded From High-Grade Polyethylene, This Planter Offers A Classy Choice For Your Outdoor Decor Needs. Long-Lasting Beauty, Durability And Quality. Built-In Water Reservoir Encourages Healthy Plant Growth By Allowing Plants To Practically Water Themselves.Create A Beautiful Coastal Appeal. The Creston planter offers a fresh modern looking design. The angled top shape creates a unique and elegant look providing a beautiful accent to the entrance of any home. Double wall molded design and constructed from 100% polyethylene which delivers an amazingly realistic, incredibly strong and remarkably lightweight planter. Complete the look of your Fairfield or Cape Cod window box with a pair of decorative supports. The curved brackets are the perfect finishing touch to your installation. Lakeland 20-inch x 20-inch Planter in Espresso Our Lakeland Planter Has The Look Of Wood Without The Upkeep. Molded From High-Grade Polyethylene, This Planter Offers A Classy Choice For Your Outdoor Decor Needs. Long-Lasting Beauty, Durability And Quality. Built-In Water Reservoir Encourages Healthy Plant Growth By Allowing Plants To Practically Water Themselves.Create A Beautiful Coastal Appeal. 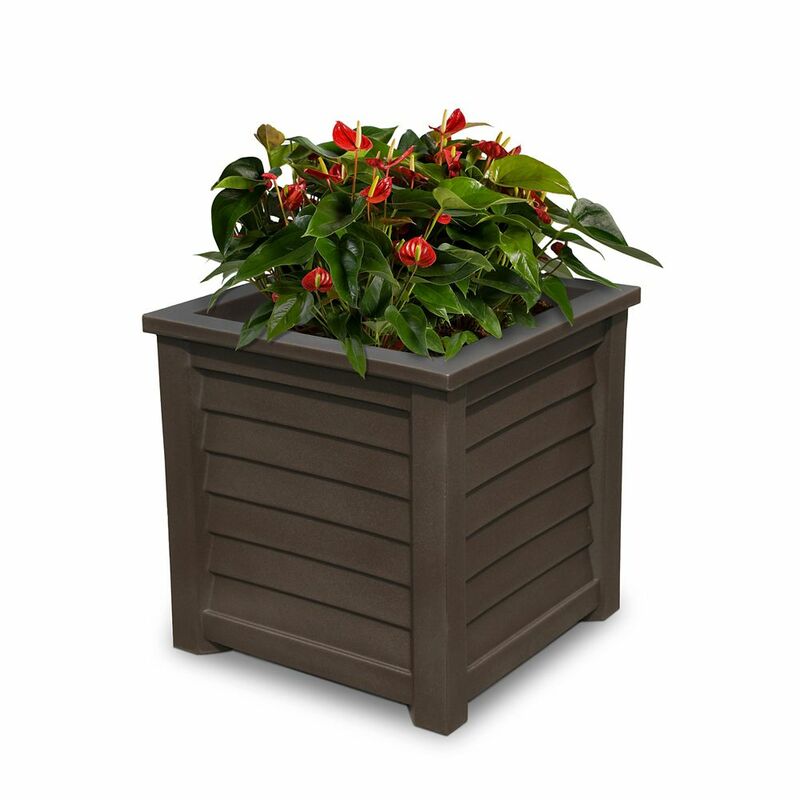 Lakeland 20-inch x 20-inch Planter in Espresso is rated 5.0 out of 5 by 1. Rated 5 out of 5 by rxn3011 from well made and just as described. well made and just as described.